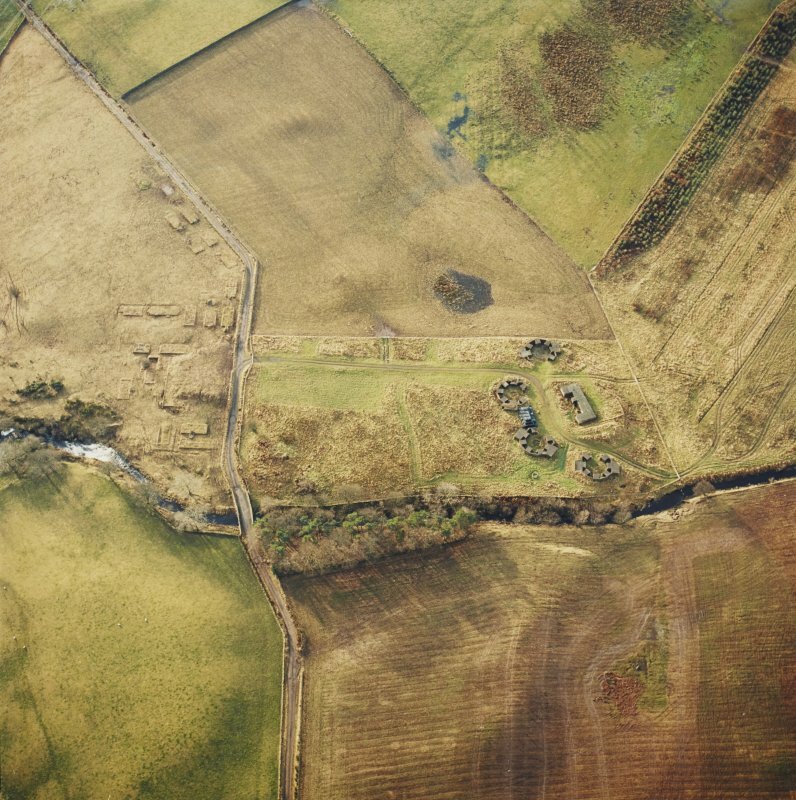 Oblique aerial centred on the remains of the anti-aircraft battery, taken from the WNW. 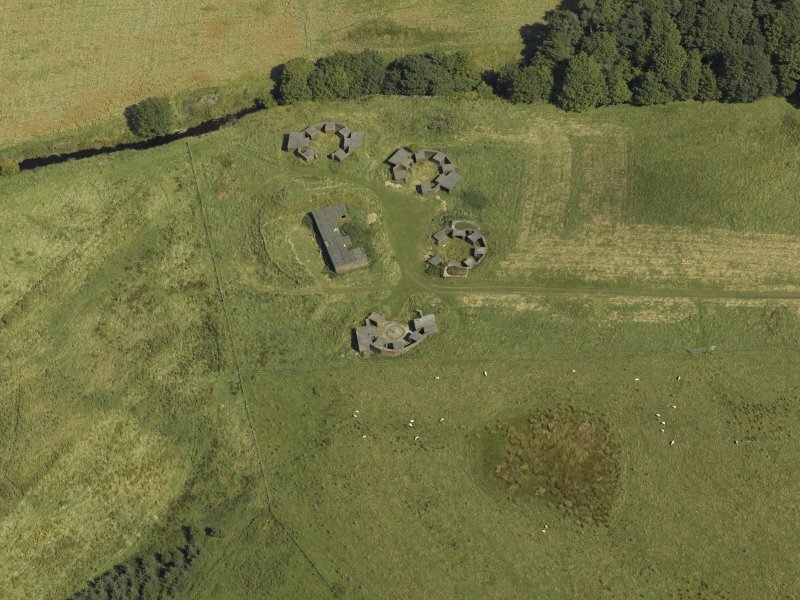 Oblique aerial view centred on the anti-aircraft battery, taken from the N.
Oblique aerial view centred on the remains of the anti-aircraft battery, taken from the NNE. 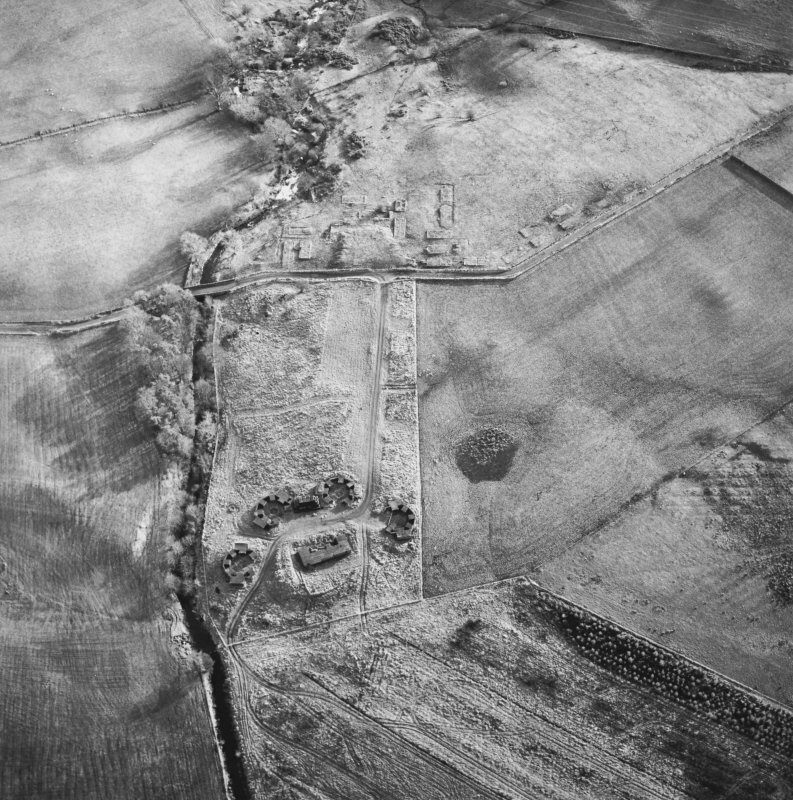 General oblique aerial view centred on the remains of the accommodation camp, taken from the WNW. 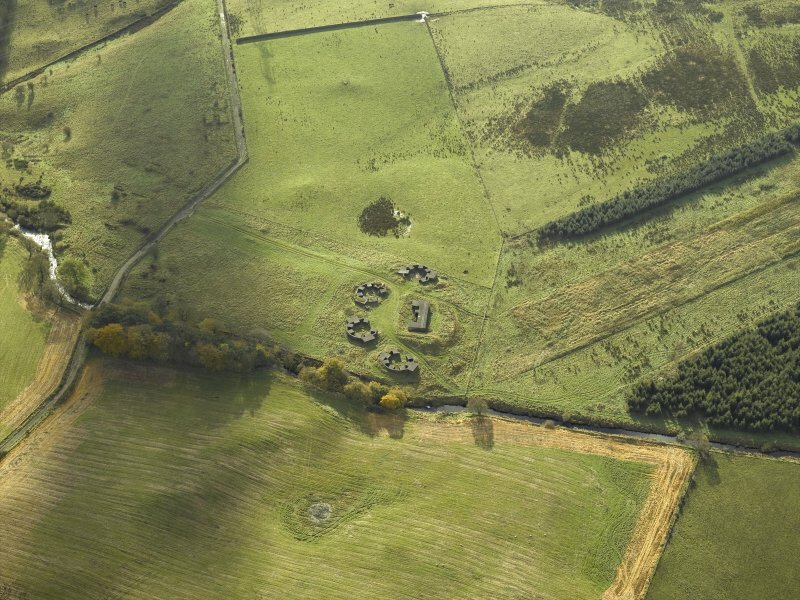 Oblique aerial view of Port Glasgow High Mathernock Battery centred on the remains of an anti-aircraft battery, taken from the N.
Oblique aerial view centred on the anti-aircraft battery, taken from the SE. 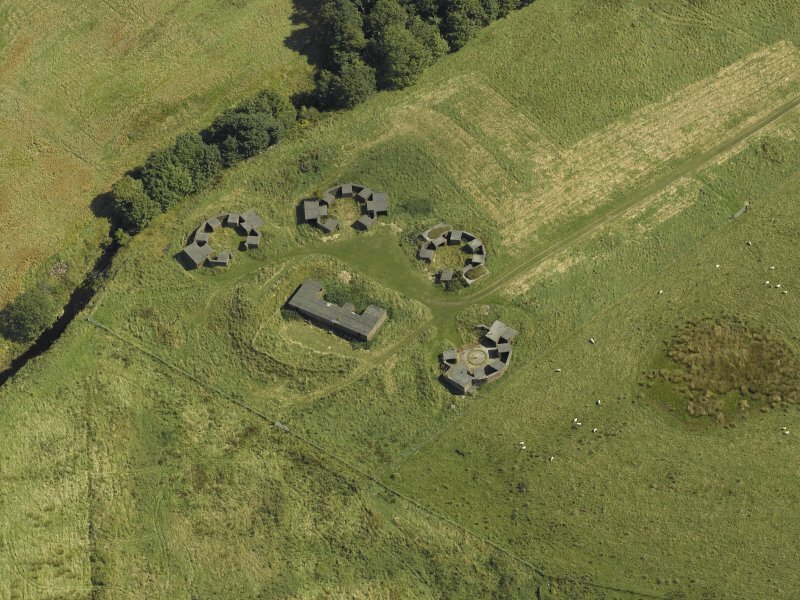 Oblique aerial view centred on the anti-aircraft battery, taken from the SSW. 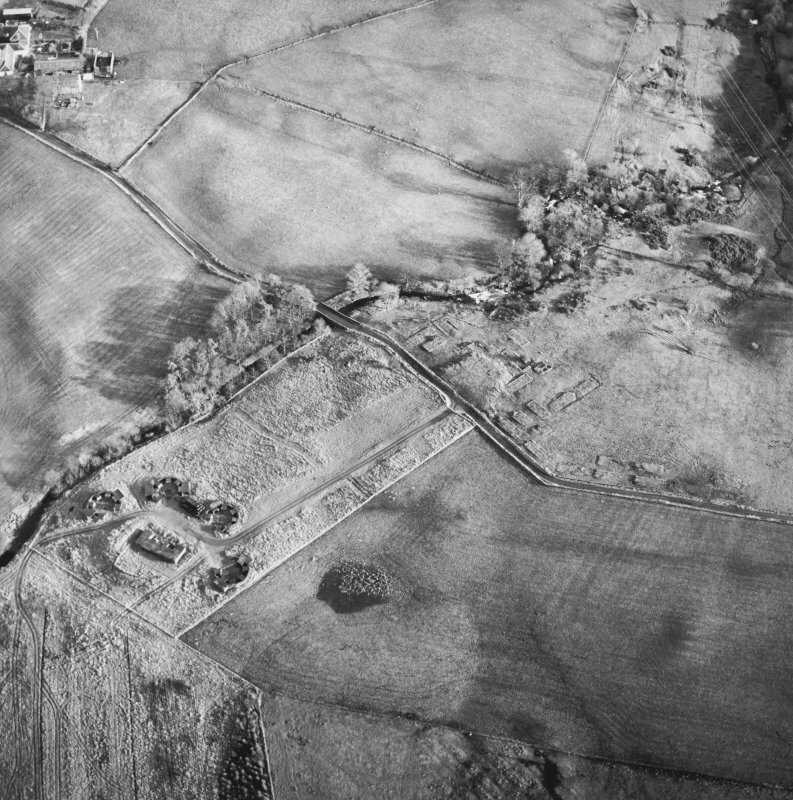 Oblique aerial centred on the remains of the anti-aircraft battery, taken from the NE. 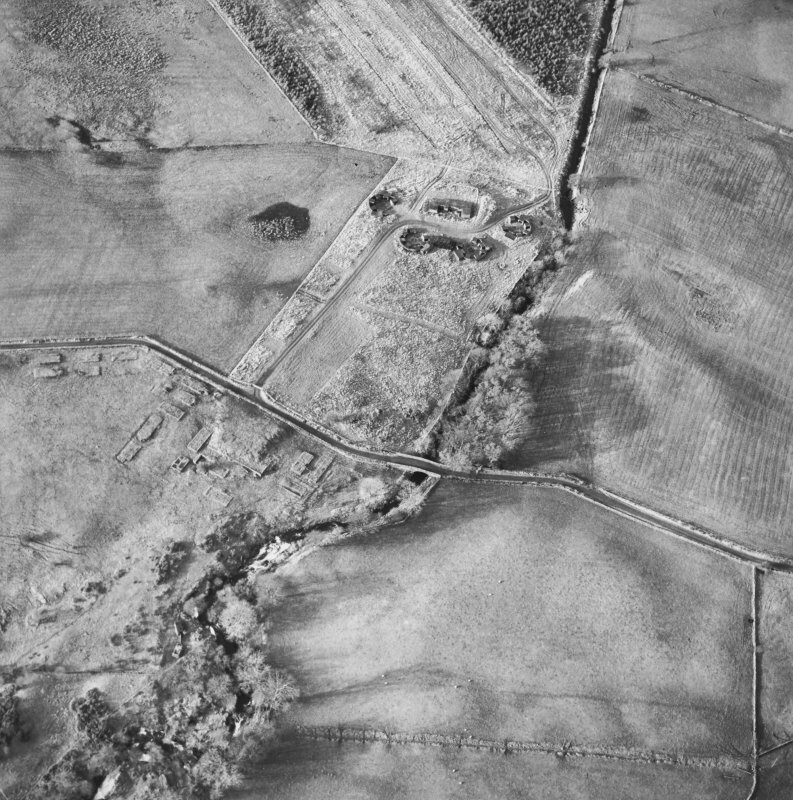 Oblique aerial centred on the remains of the anti-aircraft battery, taken from the ENE. 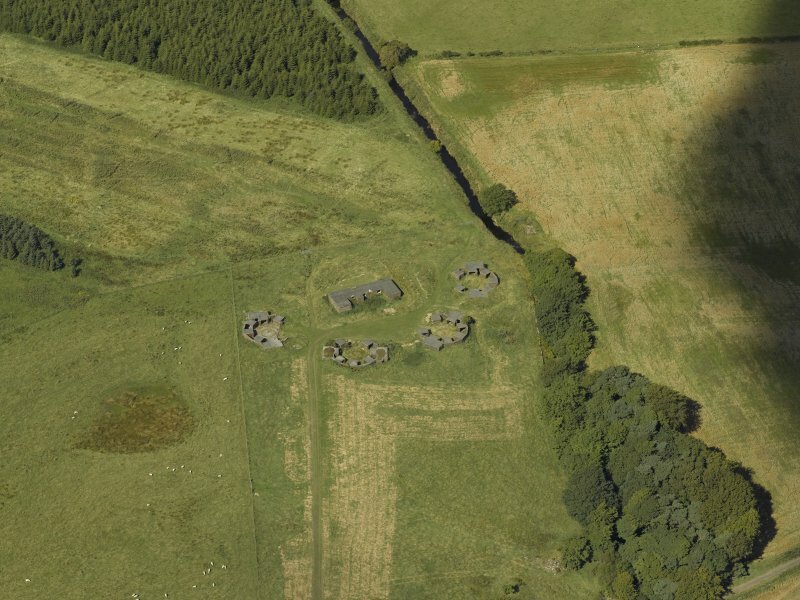 Oblique aerial centred on the remains of the anti-aircraft battery, taken from the ESE. Oblique aerial view centred on the anti-aircraft battery, taken from the SW.
Oblique aerial view centred on the anti-aircraft battery, taken from the S.
Oblique aerial view centred on the remains of the anti-aircraft battery, taken from the N.
Oblique aerial centred on the remains of the anti-aircraft battery, taken from the NW. 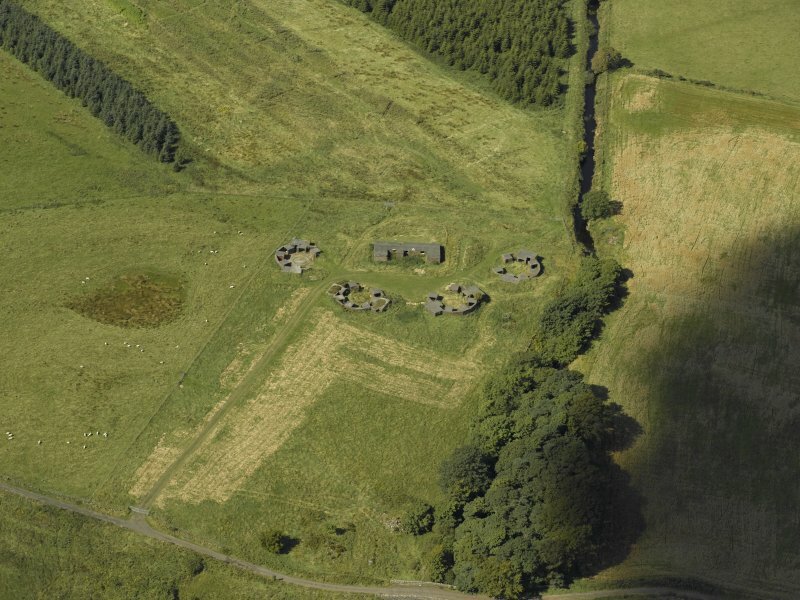 General oblique aerial view centred on the anti-aircraft battery with the remains of the accommodation camp adjacent, taken from the S.
Oblique aerial view centred on the anti-aircraft battery, taken from the NE. 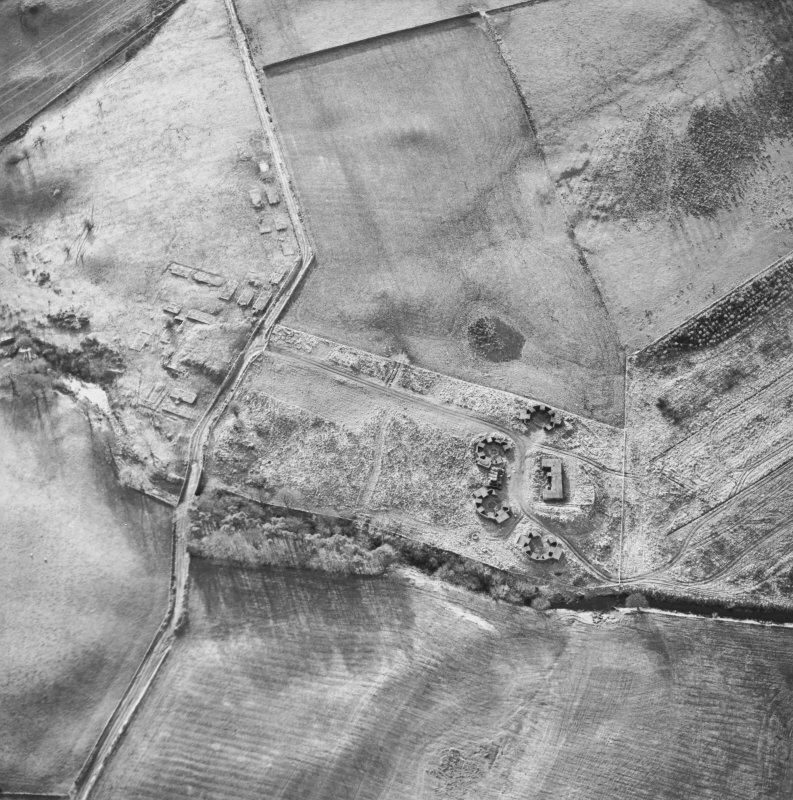 Oblique aerial view centred on the anti-aircraft battery, taken from the NW. 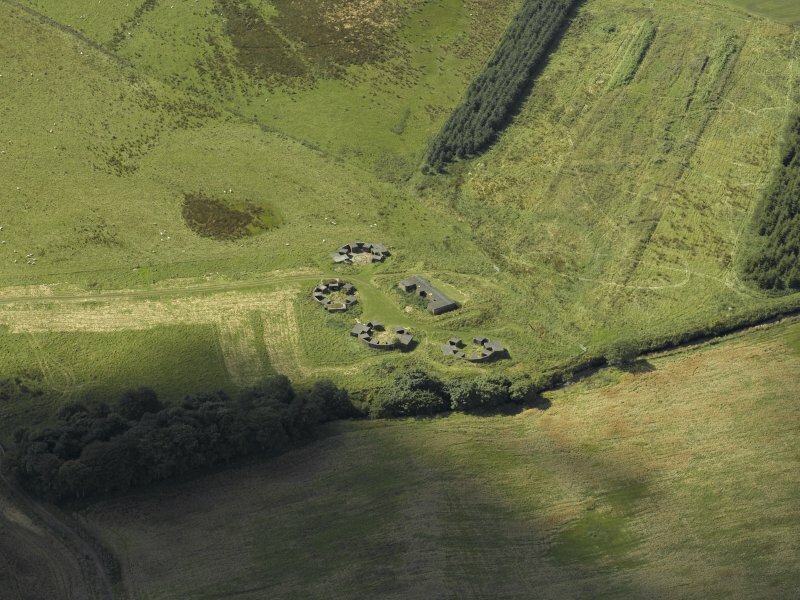 General oblique aerial view centred on the anti-aircraft battery with the remains of the accommodation camp adjacent, taken from the SSW. 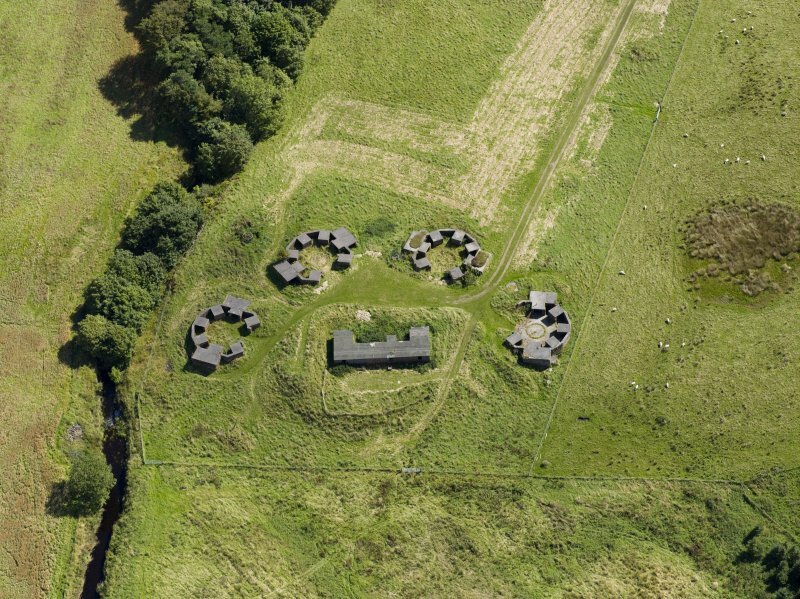 Oblique aerial view centred on the anti-aircraft battery, taken from the SSE. 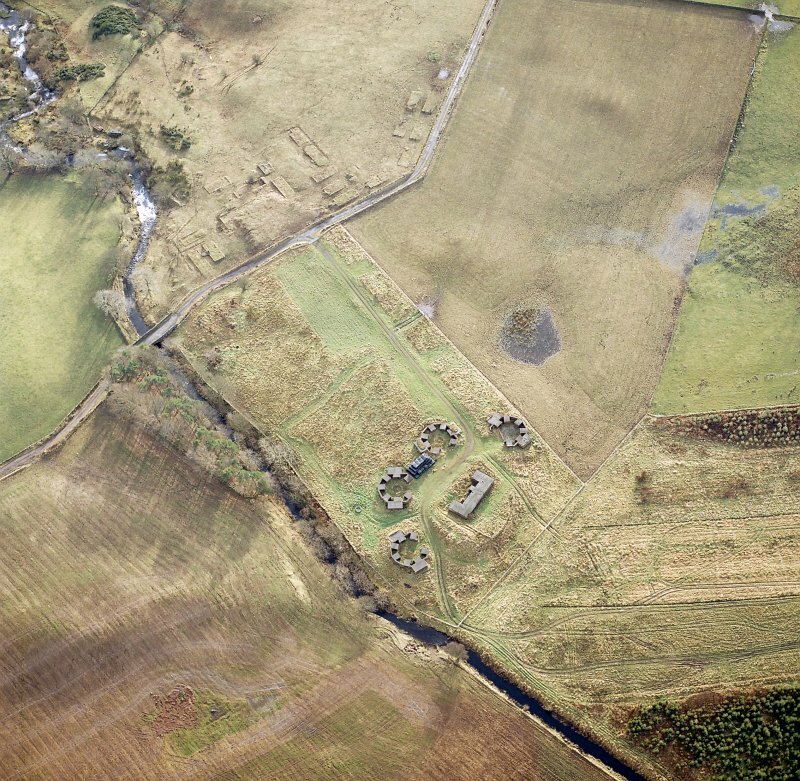 Oblique aerial centred on the remains of the anti-aircraft battery, taken from the W.
Oblique aerial centred on the remains of the anti-aircraft battery, taken from the E.
Oblique aerial view of the remains of High Mathernock anti aircraft battery and accommodation camp, looking to the ESE. 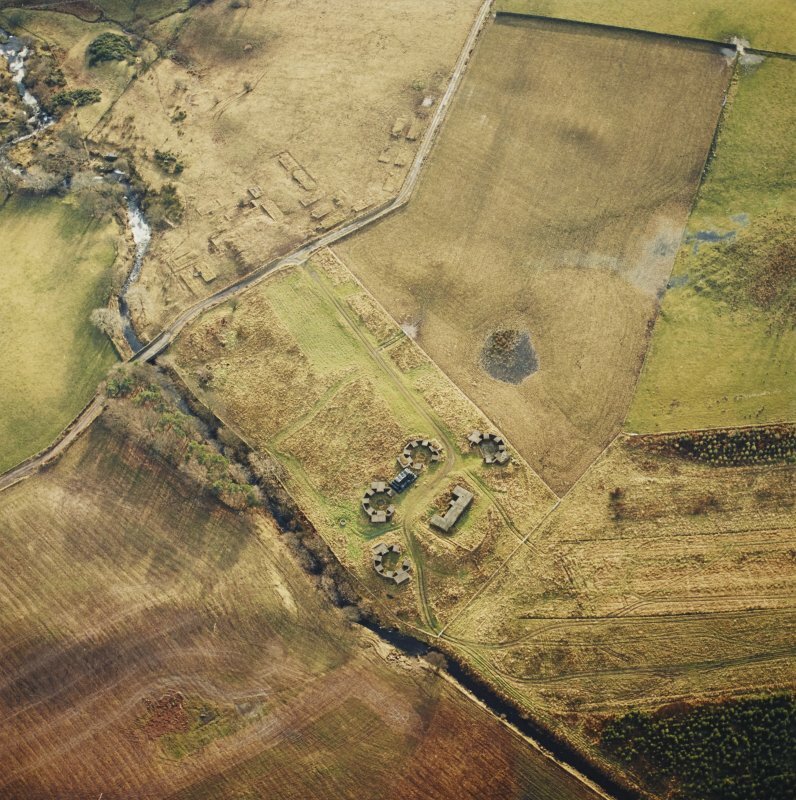 This anti-aircraft battery is situated immediately to the W of Mathernock Bridge. The battery consists of four brick built gun emplacements and a command post. The command post where the instruments were has been demolished. The remainder of this battery is in fair condition, the gun emplacements are used as cattle pens by the farmer. 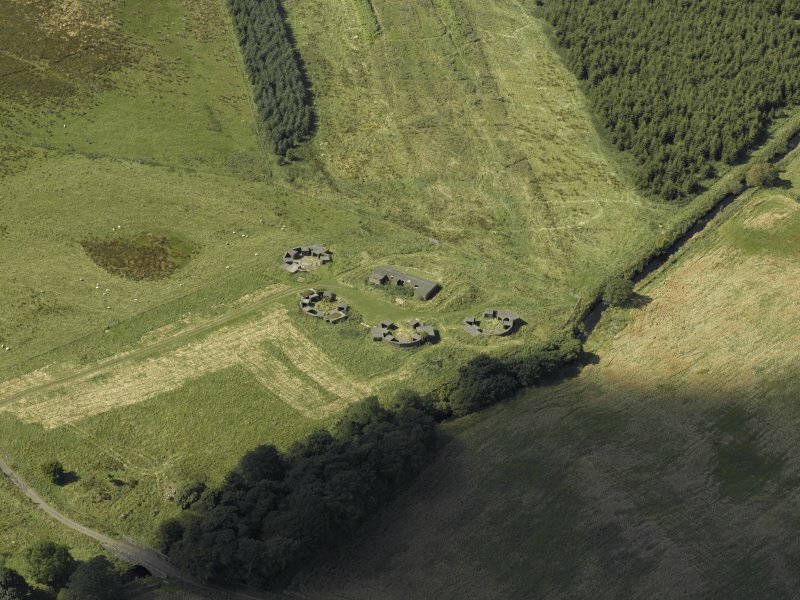 There are many hut bases to the SE of the site on the other side of the track. Information from Mr J Guy, August 1996. 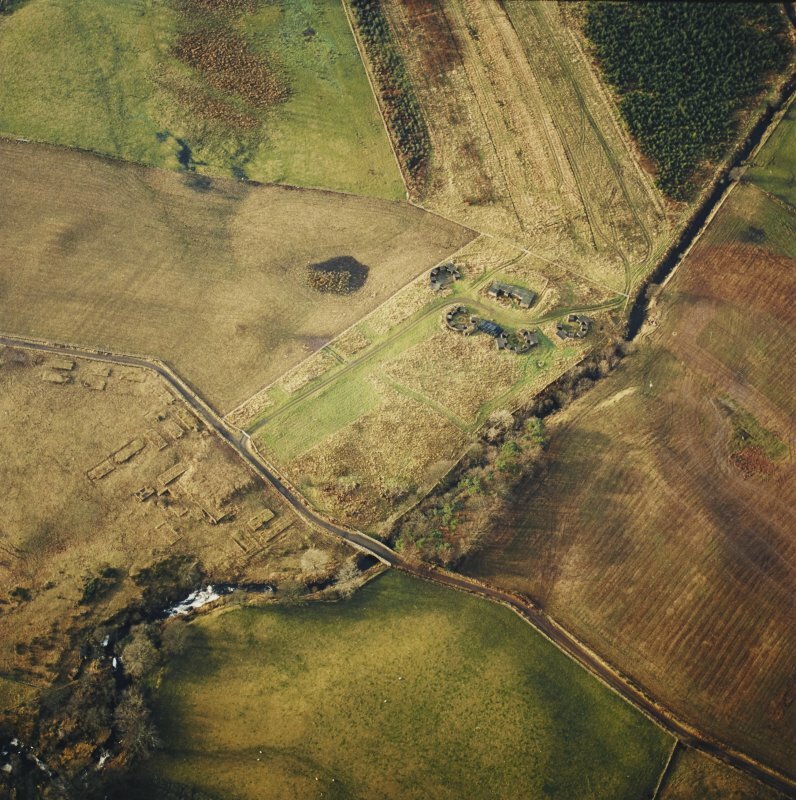 This World War II heavy anti aircaft battery is situated on the W side of High Mathernock Farm. The four gun-emplacements and the partly demolished command post are still extant. 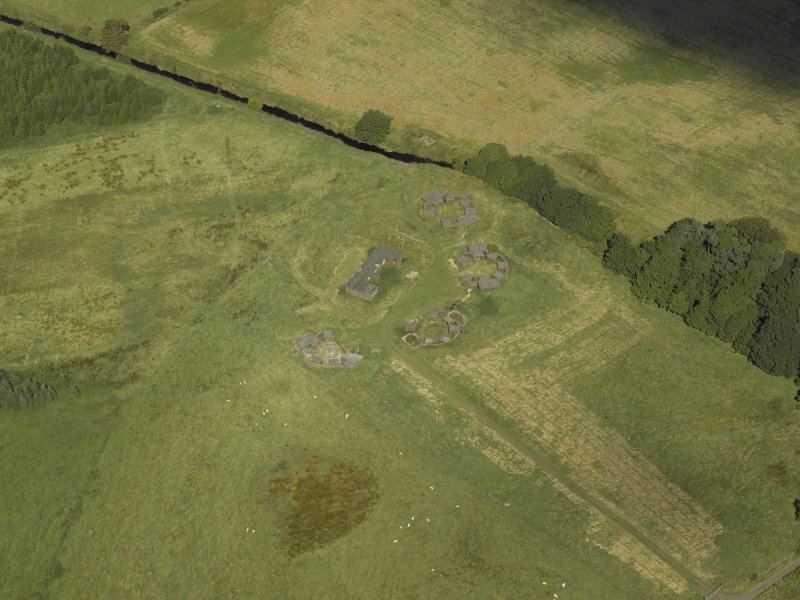 The hut bases of the accommodation camp survive in a field on the other side of the track (NS37SW 53.01). Records show that the battery was armed with 4 3.7-inch guns. J Guy 2001; NMRS MS 810/11, Part 2, 160-1; Vol.2 (appendix), 15. 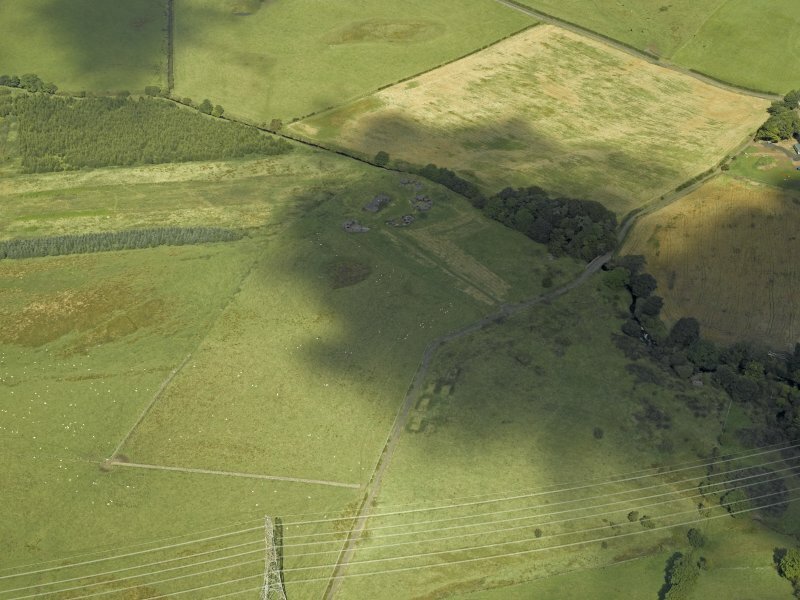 This heavy anti-aircraft battery is situated on the crest of a NW-facing scarp in improved pasture immediately SW of the Gryfe Water and about 350m WSW of High Mathernock Farm. 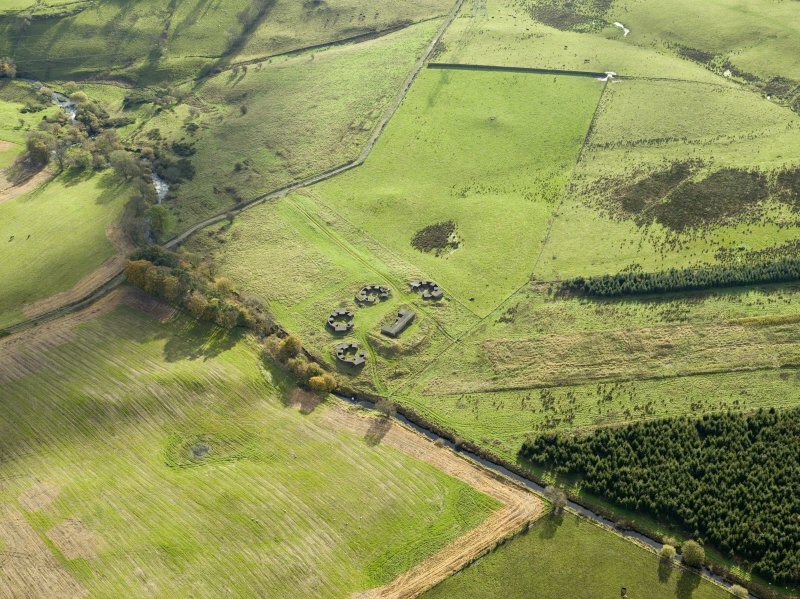 It comprises four gun emplacements, a command post, the foundations of twenty-four buildings associated with the camp, together with a sewage works. This was one of at least forty-seven heavy anti-aircraft emplacements that were installed to protect the industries in the centre of Glasgow and along the banks of the River Clyde during raids by the Luftwaffe. The battery is approached from the public road to the SE by a grass-grown track for about 125m before this turns sharply NNE to pass between the gun emplacement and the command post. All the gun-pits are planned around the circumference of a circle with a radius of 35m pivoted on a NE to SW axis. The four gun-pits (NS 32193 71034, NS 32201 71008, NS 32187 70984, NS 32160 70978) can be separated into two pairs, one on the NE arc of the circle and one on the SSE. All (save for a minor modification to that on the SE) are of the same design and each is protected by the remains of an earthen bund, although the external walls retain some rare traces of an external cement render. They are irregular dodecahedrons on plan and measure 14m in diameter within brick blast walls 0.5m thick and 1.7m high. Single gateways measuring 3.6m wide face towards the command post. However, the gateway in the E gun-pit has been damaged, while that in the SSW gun-pit has been deliberately enlarged. In each gun-pit, five ammunition lockers measuring 1.85m by 1.65m and 1.9m deep within brick walls 0.5m thick, are built against the inner side of the blast wall. They are symmetrically arranged with one positioned opposite the entrance. Each has a flat concrete roof, a raised concrete floor and one open side; but three of the lockers in the SE gun-pit have lost their back walls. Two more diametrically opposed ammunition lockers, measuring 1.85m by 1.6m and 1.85m deep within brick walls 0.5m-0.65m thick, open on to the centre of the gun-pit. Behind these is a crew shelter, situated outside the main line of the blast wall, to which access is had by a short flight of steps from the gun-pit. They are rectangular on plan and measure 4.75m by 2.3m transversely within brick walls 0.48m thick and 2.2m high. 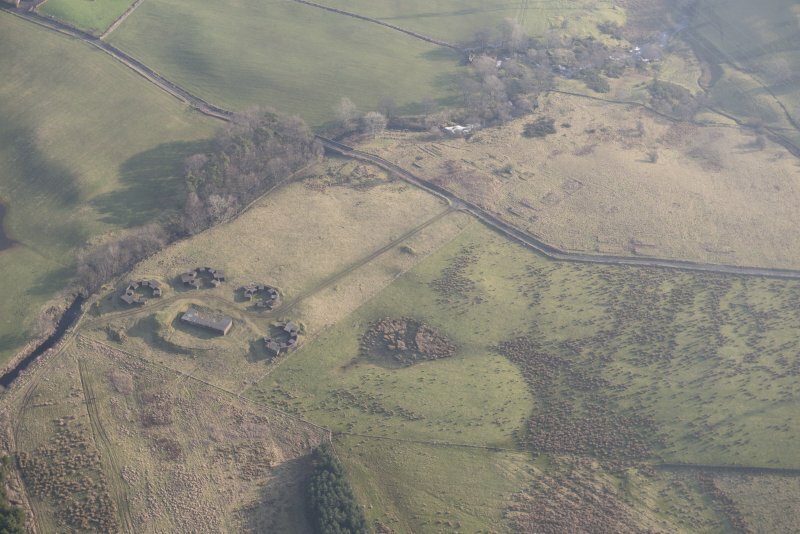 A circular perforation in their flat concrete roofs may have been provided for the chimney of a stove, but their original turf capping is only preserved on the roofs of the pair in the SE gun-pit. Both shelters in the E gun-pit have lost their rear walls, while the more southerly has a bricked-up entrance. The concrete hard standings are largely grass-grown except that in the SSW gun-pit. This is closed off by a galvanised metal field gate, as it remains in occasional use as a pen. Its hard standing is slightly domed to facilitate drainage, while the holdfast has a circular arrangement of ten metal fittings measuring 2.4m in diameter, broached only on the NNW by a cable duct running to its centre. The enlargement of the original gateway has led to the loss of an ammunition locker on the E, although what appears to be the latter’s detached roof is situated on the ground close-by. By contrast, the locker on the SSW and the crew shelter on the SE have been refitted with metal doors to allow them to be used for storage. Temporary metal steps placed against the exterior of the N locker provides access to a railed area on the roof of the NW crew shelter, which is designed as a stand for sports shooting. The minor modification to the design of the SE gun-pit (referred to above) takes the form of a small brick-built cubby hole with a flat concrete roof, which is attached to the rear of the NE crew shelter and was accessible only through the bund. Its entrance is 0.85m wide and it measures 2m deep. The command post (NS 32172 71010), which is largely brick-built and generally denuded of its earthen bund, is situated WNW of the track serving each of the gun-pits. It is rectangular on plan and measures 20m from NNE to SSW by 7.9m transversely over brick walls 0.48m thick and 2.3m high. However, the concrete terrace on the ESE that supported the platforms for the height finder, the spotting telescope and the predictor has been completely demolished, although its original level is marked by an offset in the brick wall immediately behind where it stood. The porch, with its flat concrete roof and whitewashed walls and ceiling, remains intact; but the steps that once led down from the back of the terrace to the control rooms have been completely removed - possibly to facilitate access from the present ground level. The main block and the wings to the NNE and SSW are protected by a flat, reinforced cast concrete roof that retains its bitumen weatherproofing. Large fragments of this also cling to the building’s external WNW wall, but it is evident here and from damage at the NE corner of the NNE wing that this has been interleaved between an inner and an outer skin of brickwork. The main block, the interior of which has also been whitewashed throughout, contains two compartments – the plotting room and the space occupied by the retransmission unit; while the wings each contain two further compartments for use as offices or stores. The plotting room, which measures 9.1m from NNE to SSW by 3.15m transversely and 2.15m high, is lit by two windows that formerly looked out on to the terrace. Its concrete floor is crossed by a narrow cable duct from WNW to ESE, while the WNW wall is pierced just below the roofline by three crude apertures for ventilators. A doorway leads SSW into the room for the retransmission unit, which is lit by a single window in the WNW wall; while at the opposite end of the plotting room another door provides access to the offices in the NNE wing. The first compartment is also lit by a window in the WNW wall, while another in the party wall provides a view back into the map room. A row of ventilators are situated just below the ceiling, while a short flight of steps to a hatch in the second compartment originally provided access to the terrace. The layout of the SSW wing is similar, but there is no window in the party wall between the plotting room and the retransmission unit’s compartment. In addition, the steps leading up to the hatch are missing in the second compartment. 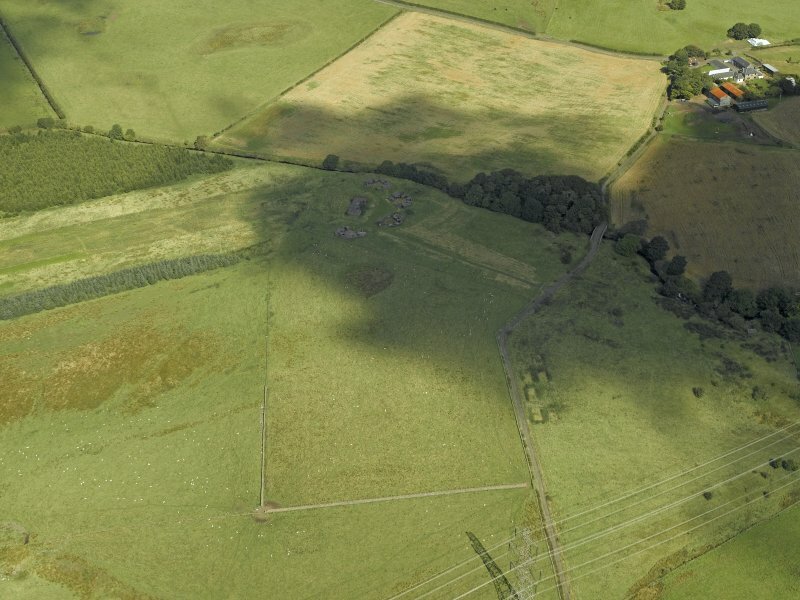 There is one isolated rectangular concrete building platform (NS 32289 70933), measuring 11m from NW to SE by 4.5m transversely, located in the same field as the gun battery, but it is situated about 125m SE and 25m WSW of Mathernock Bridge. 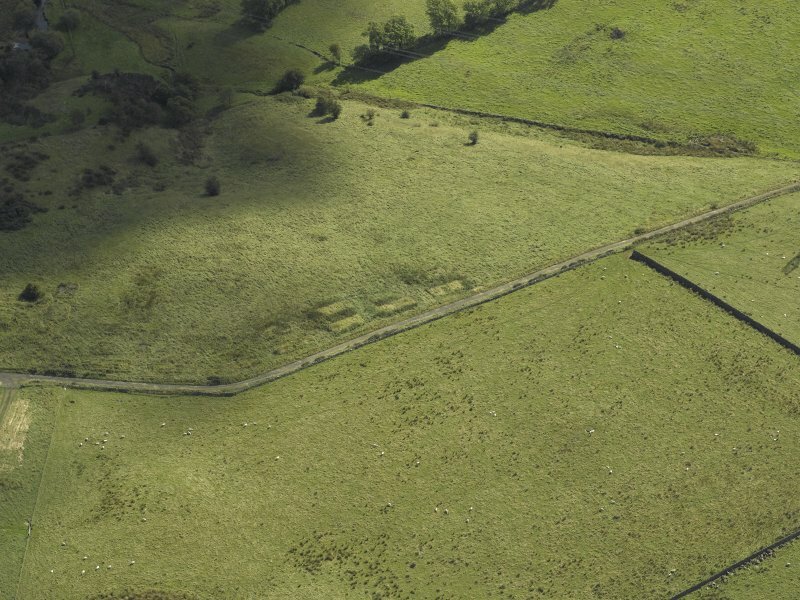 In addition, a pile a pile of concrete beams (NS 32270 70911) possibly deriving from buildings in the camp lies 25m SW.
What remains of the camp is situated in rough pasture SE of the public road leading from High Mathernock to Clachers. At least twenty-five rectangular concrete building platforms overlying brick plinths are visible (NS 32300 70898, NS 32295 70892, NS 32306 70883, NS 32301 70842, NS 32285 70854, NS 32280 70841, NS 32270 70853, NS 32268 70822, NS 32268 70880, NS 32258 70833, NS 32253 70845, NS 32246 70852, NS 32241 70858, NS 32240 70847, NS 32230 70849, NS 32225 70845, NS 32217 70832, NS 32224 70831, NS 32213 70816, NS 32221 70814, NS 32209 70799, NS 32217 70798, NS 32205 70782, NS 32201 70765, NS 32209 70763). Their footprints vary from 4m by 3m transversely to 16m by 5m transversely, but at least fifteen on the higher ground to the SSW, measuring 11m by 5m transversely, are possibly accommodation blocks. Many are approached by flights of steps at one gable end or have extensions for a boiler, while several retain low dais marking the position of stoves. By contrast, the platforms of the service blocks to their NE are largely terraced into the SE facing slope, standing up to 1m high on one side. 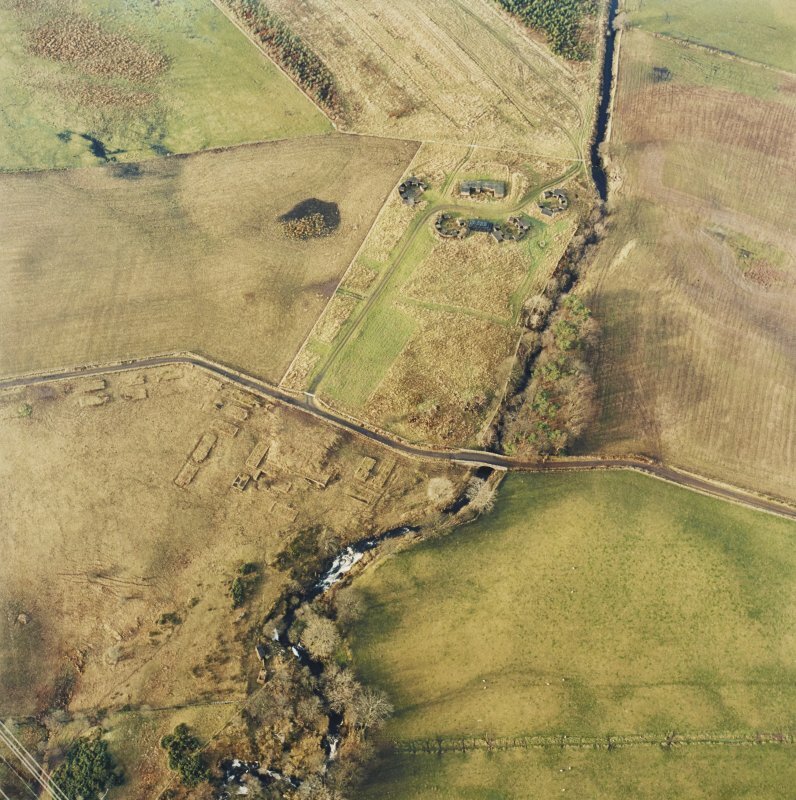 The sewage works of the camp are situated about 50m below and SE of the service blocks, where a narrow brick-built aqueduct once conveyed waste water into a septic tank located 5m S of the Gryfe Water. The latter is rectangular on plan and measures 5.7m from E to W by 2.6m transversely, over brick walls 0.23m thick and up to 2.35m high. It has been strengthened with a plinth around its footings and there are traces of a cement render, but its E end has been partly demolished. Two inspection covers in its flat concrete roof provide access via a series of iron rungs to the whitewashed interior. A whitewashed aqueduct runs from its E end to an unroofed, rectangular settling tank about 4m SE. This measures 5.85 m from NW to SE by 2.8m transversely over brick walls 0.23mm thick and up to 1.7m high. There are traces of a cement render, its footing has been strengthened with a plinth and it contains 12 square brick-built compartments.